Sometime in early 1987, Janet Harbison, who had recently established a harp summerschool in the Belfast’s Linen Hall Library, was invited to arrange a concert of harp music in the Ulster Hall as the high point in the Bicentennial Celebration of the founding of the Library in May 1988. At this time, other than Janet and Derek Bell, the Belfast born harper with the renowned Irish group ‘The Chieftains’, there was an exceptionally small number of harp players in the Ulster province. The Linen Hall Library directors, however, were not interested in hosting the two or three established solo performers in the province and issued Janet with the challenge: to fill the Ulster Hall stage with young Ulster born players and to celebrate in song and music the illustrious history of the harp in Belfast in the 1790s. Janet enlisted 22 pupils from age 7 to 16 and after intensive training and careful scoring, with guest harpists Derek Bell and Helen Davies (Wales), Belfast Opera baritone Paul Nameer, narration by B.B.C.’s Sean Rafferty, and conducted by Dr Havelock Nelson, Janet arranged a full concert programme of music from that original 1792 Belfast Harp Festival (reconstructed from the books and manuscripts of Edward Bunting) which was performed to a thronged Ulster Hall on May 22nd. The concert was a resounding success and met with widespread critical acclaim. It was also recorded by BBC and later made into two radio programmes (often repeated afterwards) which raised much excitement, enthusiasm and interest in a ‘different history’ for Ulster’s cultural traditions. The 1988 Ulster Hall concert demanded an after-life. Janet looked toward the Bicentenary year of the Belfast Harpers’ Assembly itself (1992) for the launch of the phenomenon that was to become known as the BELFAST HARP ORCHESTRA. Within a few months, the BHO had toured throughout Ireland, the UK and France and had featured at the Milwaukee Irish Fest (America’s greatest Irish festival at the time). Also, after it’s ‘support’ appearance with the Chieftains opening The World Harp Festival Belfast in July, toured more of the worlds most prestigious venues with them (including New York’s Carnegie Hall, Washington’s Kennedy Centre, London’s Royal Festival Hall) and won the 1993 Best Folk Music Album at the Grammy Awards for the Chieftains / Belfast Harp Orchestra recording ‘The Celtic Harp’. 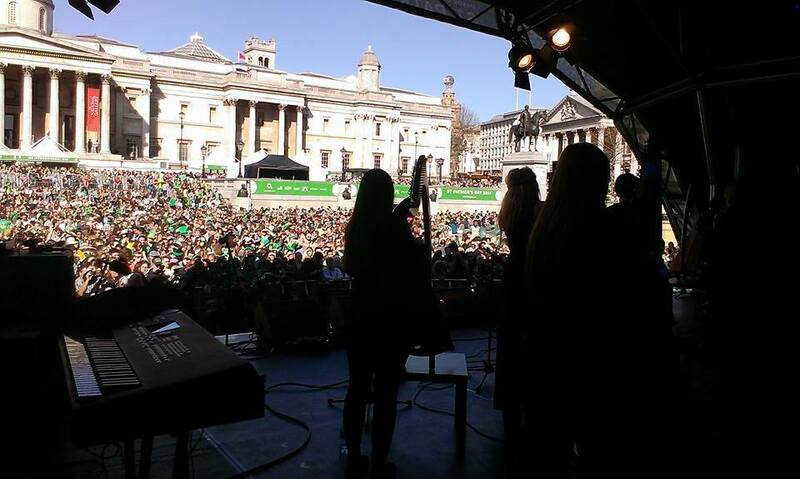 Thereupon started the great harp orchestra adventure that is still thriving today….. While the Belfast Harp Orchestra delighted in bringing a more harmonious story from Northern Ireland’s ‘troubled’ community, the return of the civil unrest after 16 months of peace in February 1998 caused enormous concerns for our international concert promoters. Every time ‘political incidents’ hit the news, the media that we hoped would be excited for us, focused on the tragic dangerous and negative, and naturally, this frightened our audiences and affected our ‘sellability’. With the continued uncertainty in our political life, our main promoters insisted we change our name – but to become the ‘Irish’ harp orchestra in Northern Ireland would have alienated and angered the ‘British’ half of our community. Alternative names were considered but eventually, it became clear that if the orchestra movement was to survive, it had to move – and so in July 2002, Janet moved the centre of operations to a wonderful 19th century schoolhouse overlooking the Shannon River (and close to the airport) in Castleconnell, County Limerick (at the heart of the Irish Republic). The orchestra continued to tour annually (although after the 9-11 Twin Towers tragedy, our American trips diminished) – mostly in Europe and the near East. From 1999, we have toured every December with Muenchen Musik through Germany, Austria, Switzerland and the Netherlands and these trips continue to be a strong motivating force for new generations of professional stage performers whose careers are launched through the Harp Orchestra. A new student orchestra with members from age 10 upwards was launched so young players from all over the Irish Republic could join the ‘orchestra movement’ and prepare themselves for the professional IHO. Based from the ‘Irish Harp Centre’ at Castleconnell, County Limerick, the orchestra continues to train more players of the future, more stage and studio stars, orchestra leaders and teachers of Dr Janet Harbison’s now widely used oral training method – that is leading the Irish harp world to vibrant new levels of involvement, recognition and glory for our national emblem. 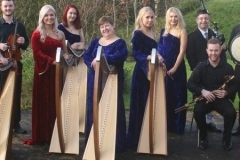 Being launched in late June 2014, the Brian Boru Harp Orchestra is a massed assembly of harp players of all types (classical concert, folk, celtic, Irish) from harp ensembles from all corners of the world who participate in a summer ‘orchestra experience’ under the direction of Janet Harbison. In 2014, the featured music is a completely new large scale stage music production entitled “Brian Boru, Lion of Ireland” (for more click here) which will take place in St Mary’s Cathedral, Limerick from August 18 – 24. The work also involves massed choirs (under the baton of Maire Keary-Scanlon) and Limerick Pipe Bands (under the direction of Michael Egan) and the harp scores are arranged in 4 parts catering to players from minimum 2 years of learning experience up to advanced. 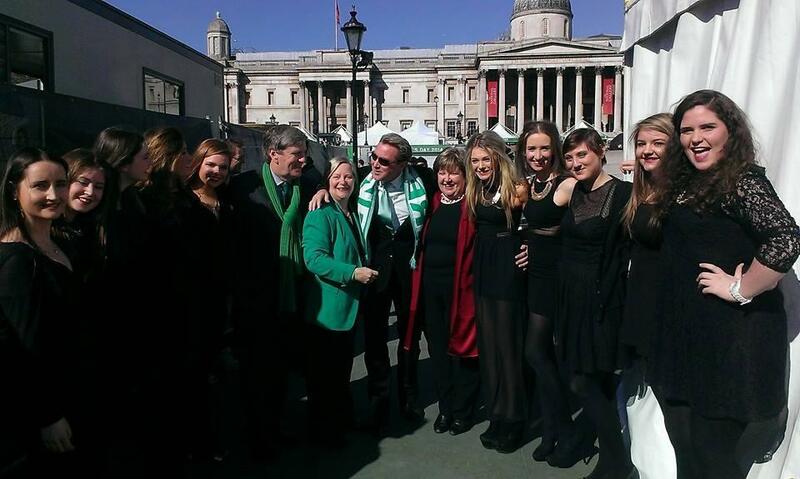 Part of the work was premiered at the St Patrick’s Festival Concert at Trafalgar Square, London on March 16th.